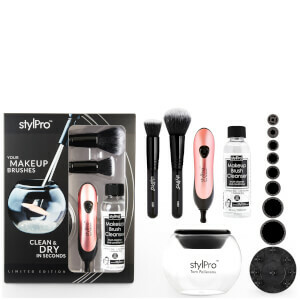 Take the chore out of cleaning your makeup brushes with the StylPro Original Make Up Brush Cleaner and Dryer, a revolutionary brush cleaning device that cleans and dries your makeup brushes in 30 seconds. Professionals recommend cleaning your makeup brushes once a week. Taking the effort and fuss out of this laborious task, the innovative brush cleaner uses centrifugal spin technology to expertly clean and dry your brushes in no time at all. Brushes are ready to use immediately after removing from the device. No more messy basins and overnight drying. Arrives with eight silicone collars built to fit all standard style natural/synthetic makeup brushes (not suitable for double ended or flat brushes). Gradually lift the spinning brush out of the liquid (but keep inside the bowl) and leave it to spin above the liquid level. As the brush lifts from the dirty liquid, the bristles will splay out and you will see the water/cleanser and dirt being spun out of the brush. Leave the brush spinning above the liquid. After 10 seconds switch off the StylPro. Your brush will be clean and dry. Makes the hassle of cleaning your brushes SO EASY - I don't know what I did without this product! So happy with this product, used it to wash all of my foundation brushes and they literally feel brand new. It's so straight forward to use & really easy to clean afterwards - would 100% recommend! this gadget saves me so much time and encourages me to clean my brushes much more often because its also quite soothing to use. it doesn't use too much brush cleaning fluid either and my brushes look like new again. they are soft and bone dry ready to use. the best investment I have made in ages. make up goes on so much nicer with clean brushes and of course its much more hygienic to keep them clean especially if you suffer from the odd break out. 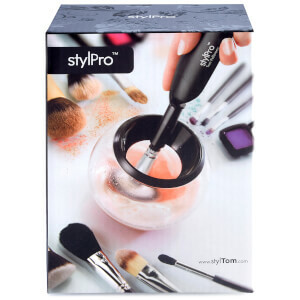 highly recommend this model also as my DIL bought a cheaper version and the bowl is smaller so she can''t spin dry a brush as big as a kabuki as this one does faultlessly she also says she has to clean a few times with fresh liquid so we suspect it does not spin as fast. treat yourself its worth every penny! 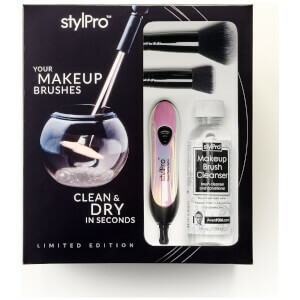 I love this product, it makes cleaning your makeup brushes so easy! Literally a game changer!! So thorough and super quick and easy to use! This device has been a game changer. I am notorious for not washing my makeup brushes, the way that they would dry just put me off. So instead I would just buy a replacement set which is not only a massive waste but expensive too. Well no more! I now clean my brushes religiously which my skin and bank account are very grateful for. I just wish there was more of the cleaner in the box. This is the best product I think I have ever used, who knew cleaning brushes could be enjoyable. 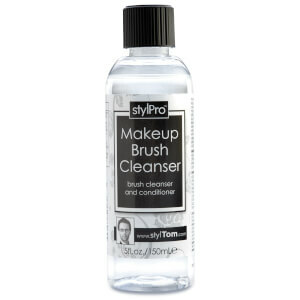 I now use this every weekend it takes seconds to clean and refresh my brushes. My skin has appreciated this too!! LOVE it. Used to be awful at remembering to clean my brushes but this makes the process so easy and effective that I am doing it weekly.